we are strange creatures of habit, and as a result often creatures of unconscious stupidity. 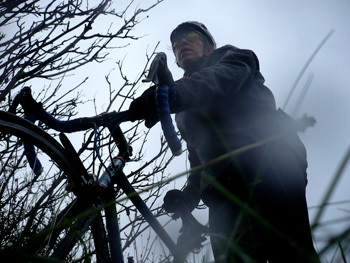 it is my firm belief that the only way to properly test anything that arrives with the word waterproof somewhere about its person, is simply to go out and ride it in the rain; the heavier, the better. with the clocks going back one hour this weekend (in the uk), british summertime officially ends, but it's not quite winter just yet. that the weather has yet to cotton on to this state of affairs is not entirely unsurprising, saturday morning dawning windy, getting (a lot) windier, accompanied by the obligatory horizontal rain, provided the ideal, if slightly insane, opportunity to test a southsea waterproof jacket from dhb, the clothing arm (pun intended) of online sales persons, wiggle. now i might be insane, but i'm not completely mad, so while i did extricate the colnago kicking and screaming from the bikeshed, i didn't go too far, a choice made all the more startlingly real by a gale force crosswind, gusting to around 55kph; this makes it very difficult to keep riding in a straight line. it also makes it difficult to get semi-decent, rain-soaked photos. but all this accumulated difficulty has exactly the same effect on the jacket; if the rain is being blown at its outer coating with a ferocity that was perhaps not considered at the time of design and construction, it would be interesting to rate its performance. the southsea jacket is offered in two sartorially acceptable styles, both paying lip service to that of tweed in grey or brown. the fabric is, if i understand the accompanying literature correctly, a 2.5 layer breathable fabric (quite how one defines half a layer, i know not) featuring fully taped seams, and thus 100% waterproof. it was this latter promise that had me flogging myself through the islay countryside, when feet up in front of the telly would have been by far the better option. the full-length two-way zip is enclosed behind a storm flap that poppers into place, with double studs at the neck. it is this latter component of the jacket that may just be its partial downfall. according to wiggle, the southsea is intended as a commuter jacket, hence the styling: the jacket sent to me was a medium as requested, and i confess to it seeming a tad large. i am ever so slightly on the slim side, so perhaps i'd be better off with the smaller size, though in its favour, the length was good and the sleeve length excellent. my main problem was with the upper reaches around the chest and shoulders, and concomitantly, the collar. 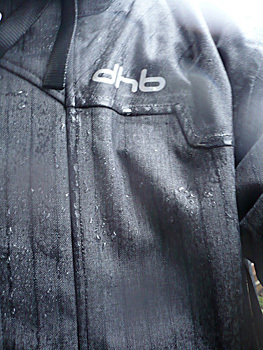 on returning from my 22km wet and windy exploration, my dhb long-sleeve jersey was pretty darned close to bone dry (apart from the aforementioned jersey collar), an impressive feat in the ferocity of the rain, and doubly so considering the effort expended pedalling against what will become my training partner until march next year. the plasticity of the taped lining had seemed less than appealing when first examined, but i do have to hand it to dhb; they have provided a rather high degree of breathability for very little money. the slightly dropped tail seems also to be of correct proportion, since there was no tell-tale damp and muddy patch at the hem, under the centre rear pocket of the jersey. nice one. the hard-worked camera along for the trip, resided in one of two flap fastening rear pockets, the right of which has a cunningly concealed zipped internal pocket all of its own. provided the flaps are kept shut, though not necessarily poppered, the contents would appear to remain faithfully dry. both sleeves of commendable length, have velcro straps on the cuffs to allow for exclusion of the elements (tight shut today) or open to aid breathability on warmer days. my only real gripe, and not uncharacteristically, a trivial one, is the lack of a tab inside the collar that would allow the jacket to be hung on a coat peg. considering its delineation as a commuter jacket, and thus likely committed to a life of pubs, coffee shops and offices, the ommission of such a simple feature seems unfortunate. however, in most other ways, the southsea ticks all the right boxes, though just watch the sizing when ordering. the ordering bit is likely to fill you with even more joy, since 100% breathable and waterproof, in this instance, costs only £59.49, quite an incredible price for something so practical and stylish at the same time. it's not really something you'd wear on the club run, but wiggle have been fairly clear in the market for which it is intended. if you own a brompton, you're sorted. 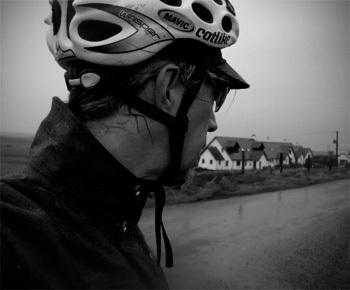 as to my allusion to the unconscious stupidity born of habit, at the start of this piece, i refer to the bizarre behaviour exhibited in trying manfully to avoid puddles of all sizes, when already soaked through (lower half only), and the bike wearing crud roadracers. as if all that surface water was going to make much difference.